December 15, 2015 (Jupiter, FL) — After much anticipation, ROK Cup Promotions is pleased to announce the 2016 ROK Cup USA race schedule and introduce a new format for the series as it heads into the 2016 season. The series will venture outside of Florida for the first time since its inception three years ago, hosting two regional championships, one in Florida and one in the Midwest, with regional champions for each class. 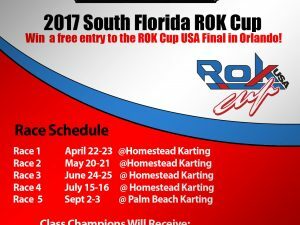 The 2016 series will culminate at a final race event, the 1st Annual ROK Cup USA National Final, hosted at Orlando Kart Center in Florida. This event will crown the national ROK Cup USA champions for the 2016 season. For the Florida Championship, the series will visit some familiar tracks, with the addition of Andersen Racepark in Palmetto as a new location in round 4. Each of the 4 rounds offers a possible maximum 300 points per race weekend, and ROK Cup Promotions is offering bonus point incentives and logistical support for drivers and teams that wish to also participate in the Midwest Championship. Drivers who attend all 4 rounds of the Florida Championship will have the possibility to earn 50 bonus points for every round of the Midwest Championship they attend. In addition, ROK Cup Promotions is organizing kart and box transport from Orlando, Florida to the Midwest races for drivers and teams that require logistical support, as well as pit space inside of a large tent that will also be facilitated through ROK Cup. In the newly formed Midwest Championship, the series ventures to Pitt Race and Newcastle for two rounds with a possible maximum 600 points for each race weekend. Drivers who participate in both rounds can also earn 25 bonus points for each round of the Florida Championship they attend. Both the Midwest and the Florida series will declare their respective regional champions, and those drivers will each earn a ticket to the 2016 ROK Cup International Final, which includes entry, kart and pit space. These two Championships will culminate in one final event, the 1st Annual ROK Cup USA National Final. 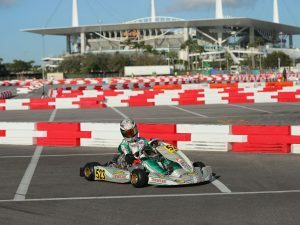 The race will take place in September at the famous Orlando Kart Center track, and will determine who will be crowned the ROK Cup USA National Champions for the 2016 season. The national champion for each class will earn a fully paid invitation to the 2016 ROK Cup International Final in Italy, which includes entry, kart, pit space, hotel, and airfare. Beyond this new format for the ROK Cup USA series, ROK Cup Promotions is bringing back their annual Micro & Mini EPCOT Challenge for a second year. This one-off event is the World Championship for Micro and Mini ROK, drawing in the best young drivers from around the globe to compete for the title of World Champion in the Micro ROK and Mini ROK classes. Hosted at Orlando Kart Center, young drivers and their families can enjoy their summer holiday in Disney’s backyard as a perfect compliment to the event, with racing taking place at night. And again, drivers, mechanics, and one guest will be treated to a privately catered Saturday brunch at Disney’s EPCOT at one of Florida’s best restaurants. “This new format for 2016 is a clear indication that the ROK series has seen growth over the past few years and has the potential to expand outside of Florida. 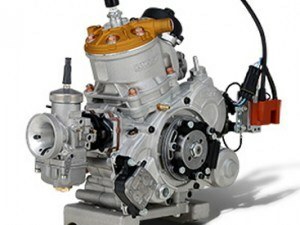 We think that this new direction, along with growing our VORTEX dealer network, will excite and entice teams and drivers in other regions to participate in ROK Cup events and give them a chance to really fight for that National Championship title.” says Series Organizer Andre Martins. 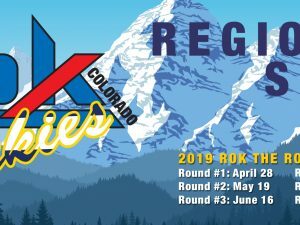 ROK Cup Promotions will soon be releasing additional information concerning registration, 2016 classes and rules, and pricing for the upcoming season, and complete details about the race schedule and event information will be available on our website, www.rokcupusa.com.